Over on the Future Shop Tech Blog I wrote an impressions piece on the recently released Star Wars The Clone Wars: Republic Heroes demo which is available for download on Xbox Live Marketplace and on the Playstation Network. "What the Clone Troopers lack in force abilities they certainly make up in weapon armaments, including blaster guns, rocket launchers, thermal detonators and EMP grenades. 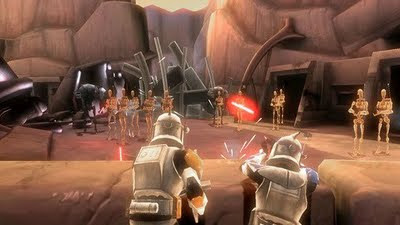 Unlike the Jedi mission, which involves plenty of close-combat scenarios, you'll find the Clone Trooper mission often involves shooting from afar and strategically utilizing the in-game cover system. The EMP grenades are particularly effective against the droid army since they not only heavily damage them, but also disrupts their circuitry causing instant immobilization -- after which you can mock your motionless foes as you blast them to smithereens."